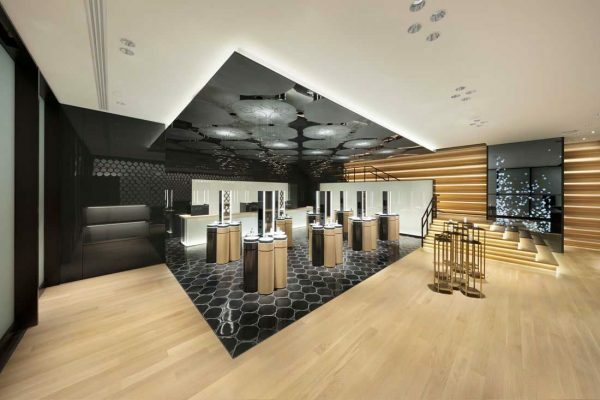 How can brand expression in a retail environment be elevated to immersive ends? 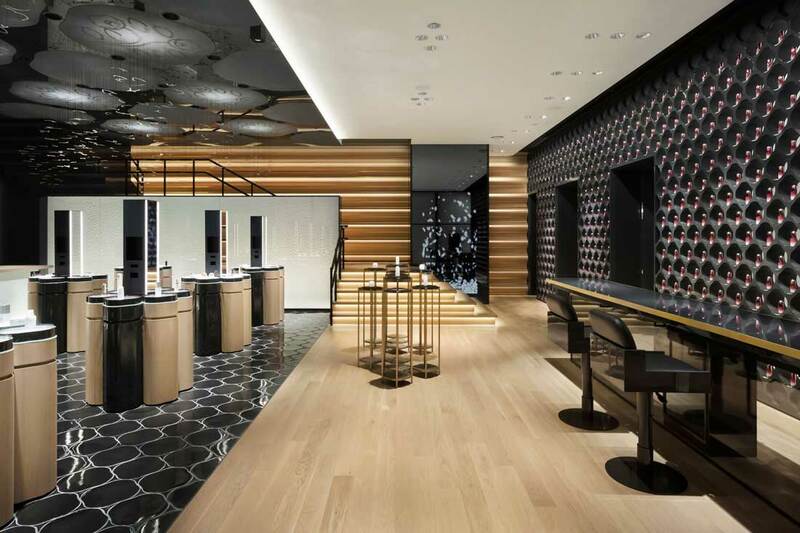 Onndo, the collaborative studio of Nendo and Nomura, took an artisanal approach to the spatial design for Shiseido’s flagship store in Tokyo, where macro and micro discoveries await. Retail shopping today is all about experience. 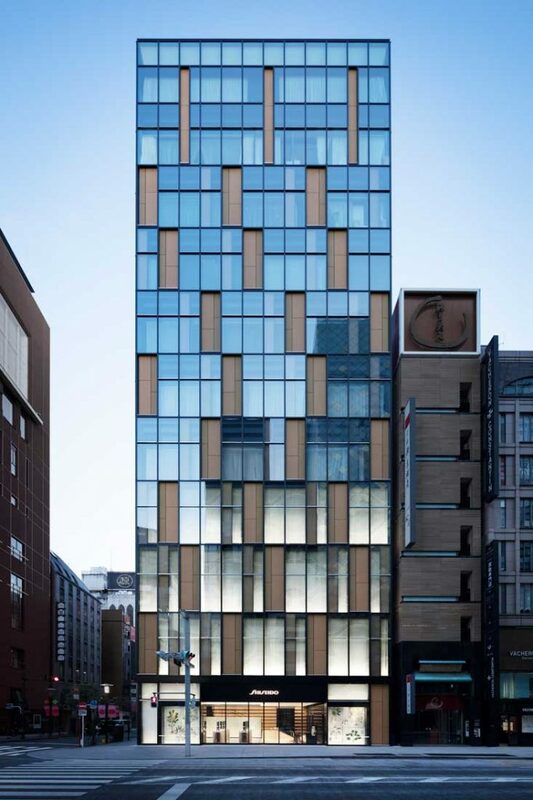 Shiseido The Store is a four-storey flagship store located in Ginza, Tokyo that has elevated the physicality of its retail experience to the immersive purity of an art installation. 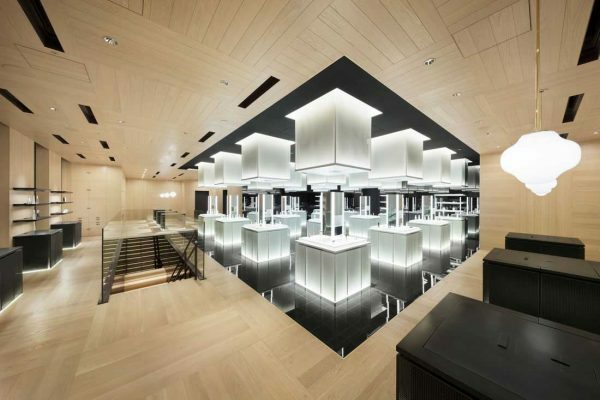 Designed by Onndo, the collaborative interior design studio operated by Nendo and multi-disciplinary design and build company Nomura, each detail of the store has been thoroughly crafted with the precision of an artisan. The ground floor showcases cosmetics. 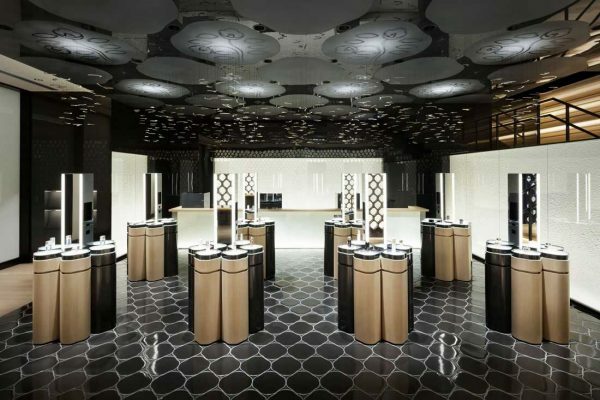 Six petal-like modules inspired by the camellia flower form each display counter – Shiseido’s signature mark designed by their first president and handed down through the generations. 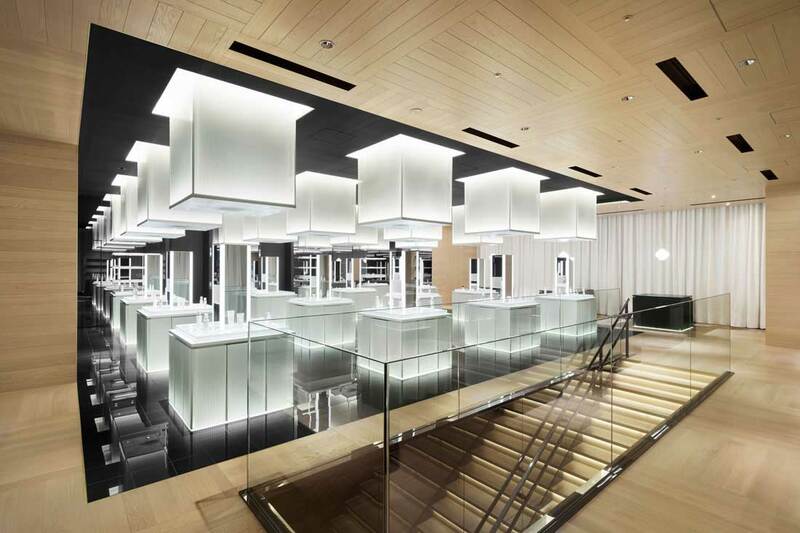 Each showcased product is given its own breathing space, softly lit from below by light-box counter tops. 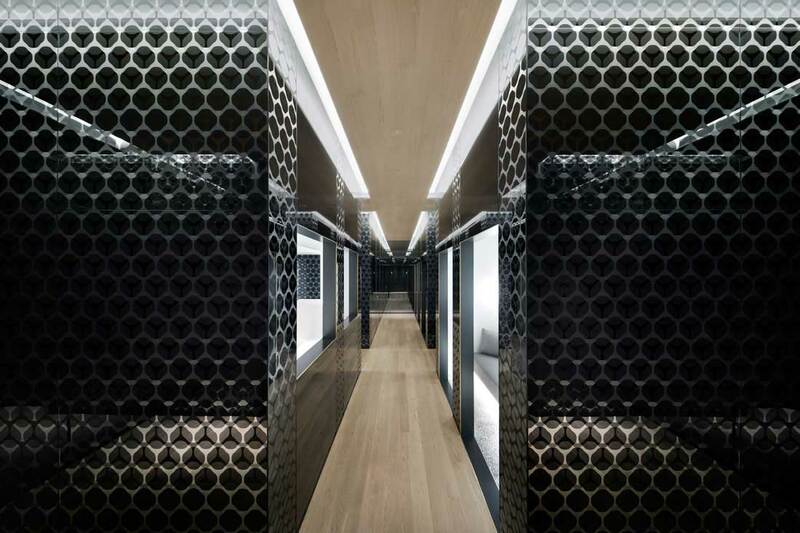 Below, glossy black ceramic-tile floors are customised in the camellia shape and align to the counters perfectly. Looking up, hundreds of slim wire threads suspend abstracted aluminium strips. 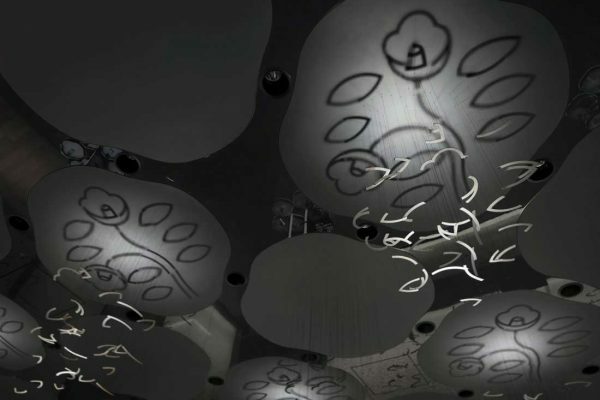 Precise uplighters cast light on these abstract elements, which merge to form shadowy camellia flowers on floating, white organic discs above. The effect is simultaneously surprising and mesmerising. 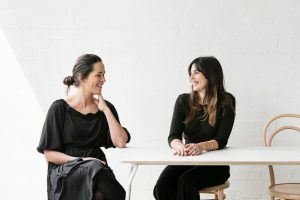 In general, when interior designers strive to translate clients’ brand identities into a physical space, the straightforward application of branding elements is hardly surprising. 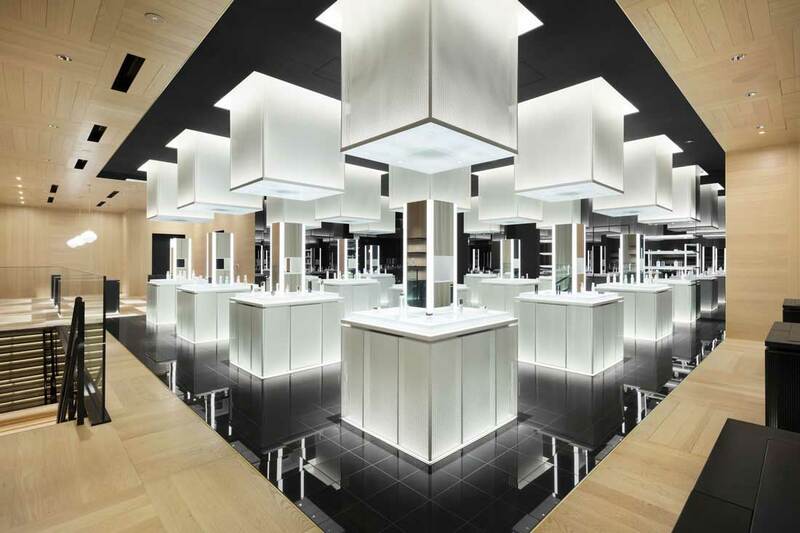 However, with this Shiseido store, Onndo has taken conceptualisation to the next level – in part by reinventing finishes in fresh new ways. The idea of layering sparked their ingenuity. When applying make-up, skincare is applied first, followed by base primer and foundation, then touches of colour using eye shadow or lipstick. 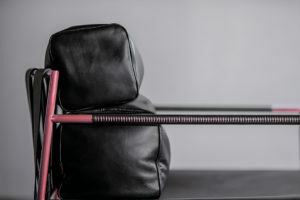 The preparation of interior walls and floors in construction follows a similar order: first an undercoat is applied, followed by paint layers and a protective topcoat. 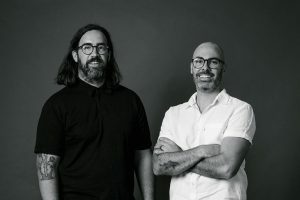 Onndo took the bold step of blending make-up with construction materials. 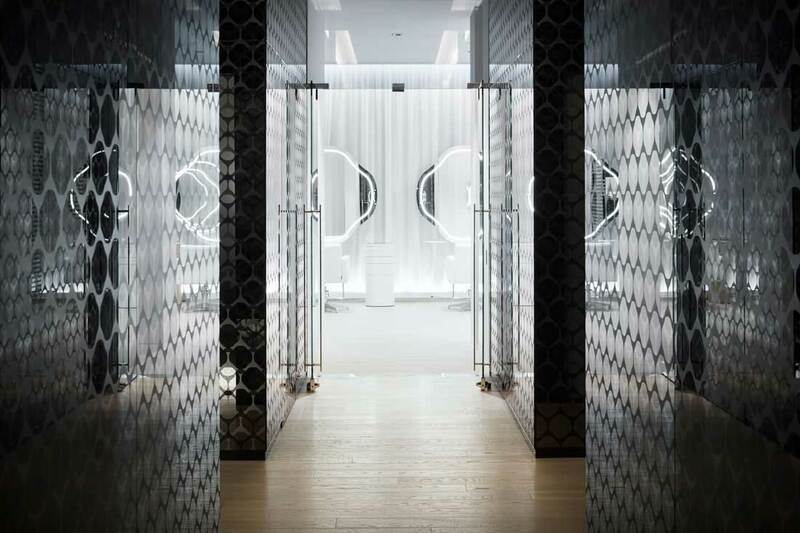 Thinly spread cotton pads were made into paper and applied on the walls with backlighting, creating textured surfaces with a nuanced glow. Camellia oil – a key ingredient at Shiseido – was smoothed onto raw wood for a beautiful sheen that will age with time. Eye shadow powders were brushed onto the walls to create marbled veins, and nail polish was mixed into ceiling paint, giving a subtle shimmer that glints in shifting light. 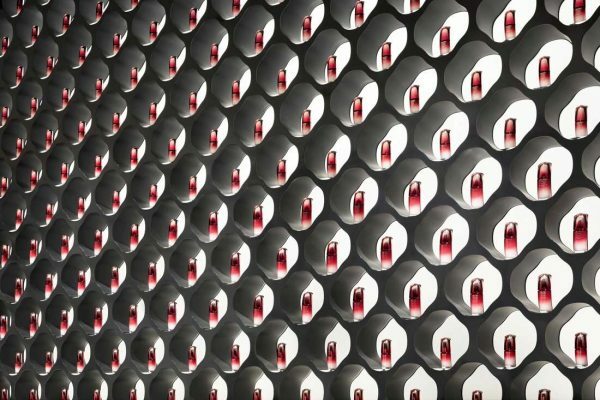 Behind a linear counter, an entire backlit wall of aluminium camellia-shaped pods houses red Shiseido bottles, creating a stunning backdrop. It is difficult not to marvel at the detailed thought behind every single element as one threads through the gallery-like space. 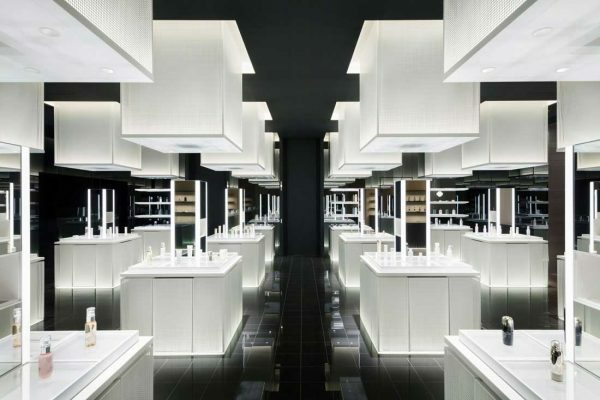 The lighting design developed with L.GROW carefully considered how to illuminate customer’s faces in a flattering way. 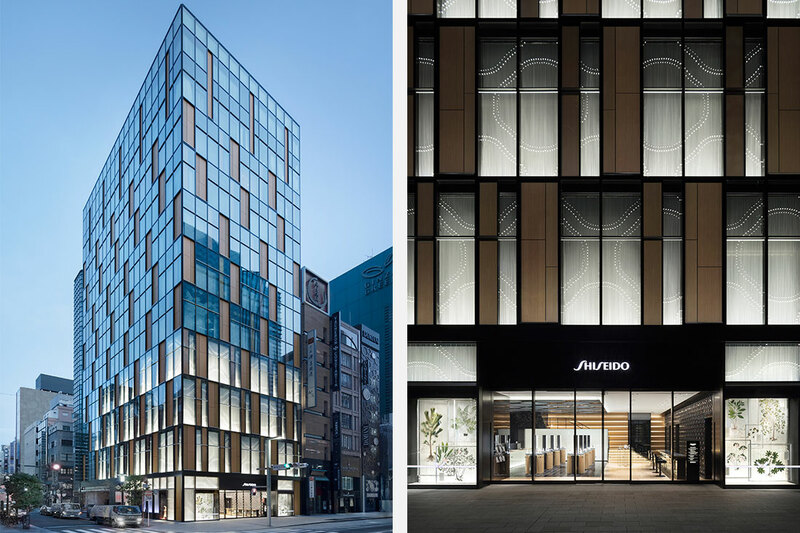 To achieve the gallery-like feel of the space, Onndo kept a consistent hand on the material palette, reducing it essentially to wood and black throughout the building. 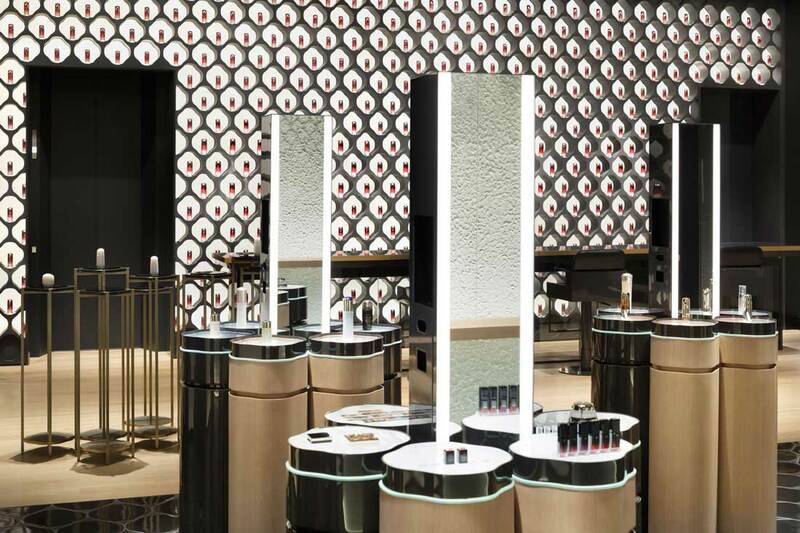 Patterns were purposefully employed for atmospheric and directional effects in addition to the communication of the Shiseido brand. 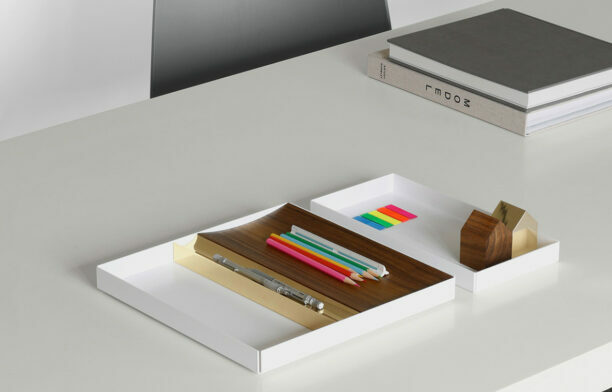 Onndo approaches every project with a fresh perspective to avoid “biased” outcomes. 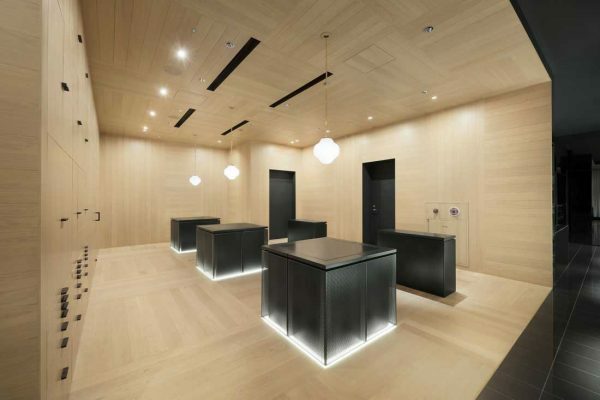 A series of light oak stairs in a horizontal array lights your way up to the second floor, where a dramatic black cube sits in stark contrast to the light wood floor, wall and ceiling environment. Your eyes are drawn immediately to the grid of rectangular product counters corresponding with floating light-boxes above. 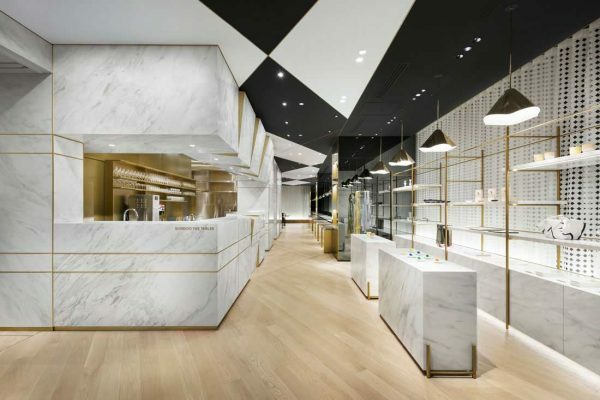 It feels futuristic yet warm; Onndo managed to strike a taut balance in their material palette of reflective black tiled floors and a grid of light oak. 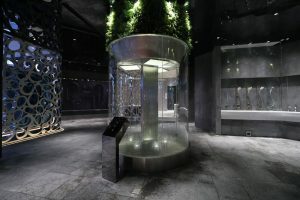 From product areas and skin care salon on the first and second floors, to a photo studio and hair and make-up salon on the third floor, to the flourth-floor café, event space and private beauty consultation booths, there is an immersive loop of programs that is complete as one heads back down to the ground level. 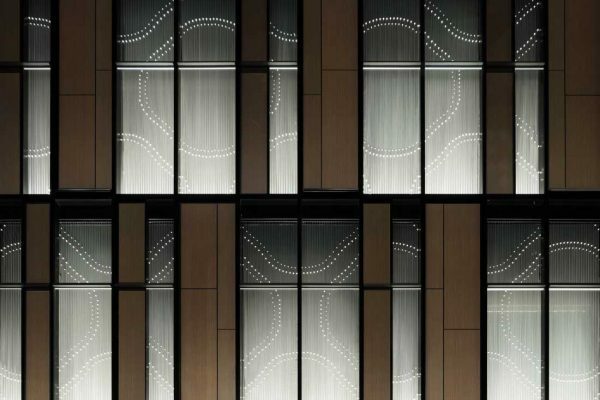 Seen from across the street, the face of the building displays string curtains intricately tied into traditional decorative knots called awaji-musubi, allowing the contours of the camellia flower to be visible behind burnished steel panels. To the Japanese, this knot symbolises the tie between tradition and creation, and the wish to build enduring relationships with customers. 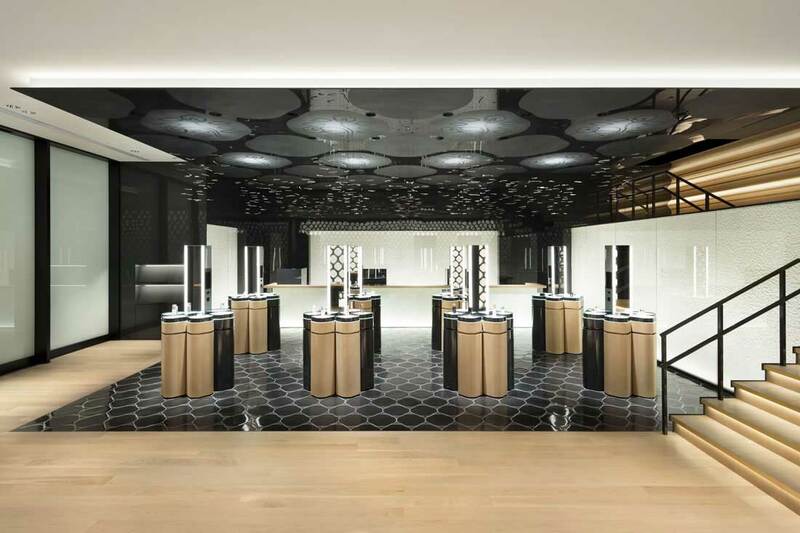 The meticulous application of the concept on multiple levels throughout the store is a perfect melding of tradition and innovation. 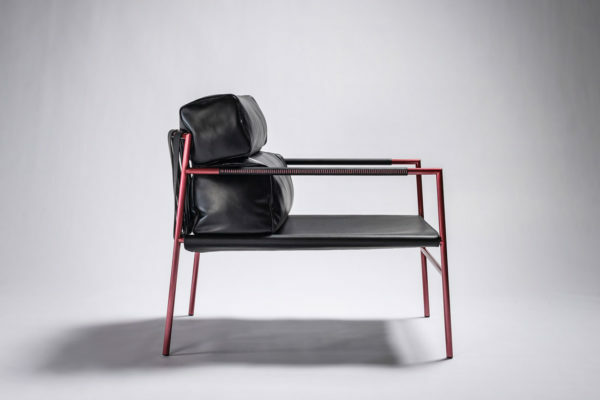 Onndo has redefined the parameters of beauty: how it can be experienced and deeply rationalised beneath the captivating surface. 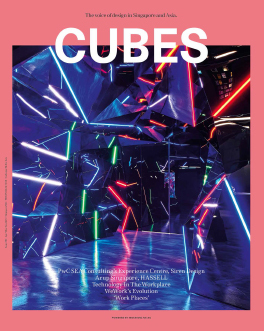 This story first appeared in Cubes issue 92: Design Digestion. Photography by Takumi Ota, courtesy Nendo and Onndo.